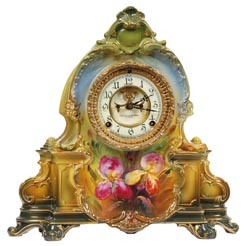 Ansonia Clock Co., Royal Bonn, "LaManche", ca 1904. This is another very attractive case style with fabulous colors. First, it is 13.75" high, 14" wide, making it one of the larger cases. The colors are greens, blues, yellows, and some yellow and rose colored flowers. Gold striping all over, of course. Just outstanding. Ly-Ansonia, page 615.